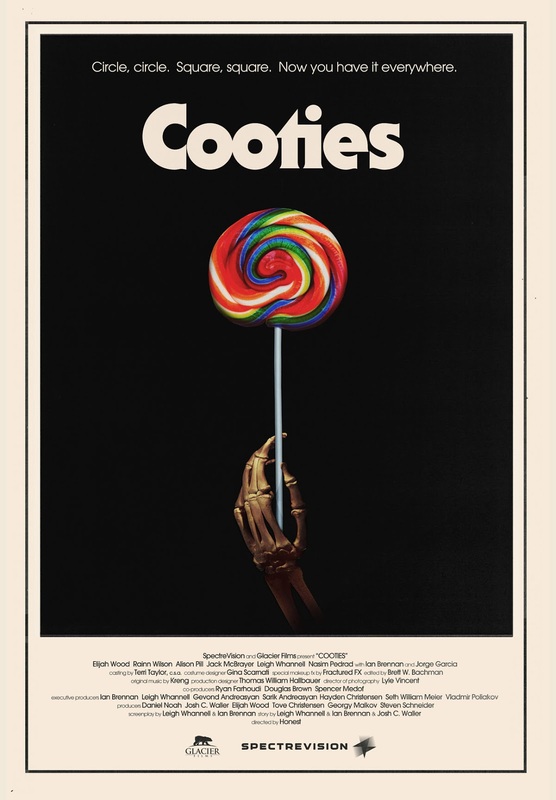 Cooties takes the tired and redundant zombies sub-genre and playfully injects it with some fresh life. It tells the story of a zombie outbreak amongst school children during summer classes when the students consume some tainted chicken nuggets. The opening credits show the chicken nugget making process in great detail in a sequence that's even more vomit inducing than any of the blood and guts zombie effects that come later. When the outbreak takes over it's first victim, a little girl in blonde pigtails, the visible disease causes taunting by the other school kids which leads to them being attacked and infected. Not long after that more kids become infected and it's an all out war between the zombie student body and the few surviving faculty. In a clever twist, the adults can't turn into zombies because they have already gone through puberty, hence the term 'cooties'. This movie is an all out blast and one hell of a good time! It reminded me of those fun horror-comedies of the 1980's that have gathered such a following over the years such as The Return of the Living Dead and Re-Animator. Even the poster of the skeleton hand holding the lollypop is meant to invoke the skeleton hand ringing the doorbell on the poster for House. So yes, this movie seems to know it's history and uses it very effectively and successfully. The writing, the cast, and the fast pace are all what make Cooties work. The dialogue is very funny, especially several exchanges between Elijah Wood and Rainn Wilson, these two were spot on in their performances here! Elijah Wood is the perfect life-didn't-turn-out-the-he-planned-had-to-move-back-home boyish dreamer as Clint and Rainn Wilson pulls off the past-his-prime-let-himself-go disillusioned small town gym teacher as Wade with tremendous ease. In the middle of these two is Alison Pill in a very charming and sweet and funny role as Lucy, Wade's girlfriend. There is also very strong and funny supporting performances from Jack McBrayer and Leigh Whannel. Great chemistry among everyone and fun, committed, and energetic performances from them all! The writing allows for some sympathy and consistent, scattered characterization for all three of the characters that really nailed these folks down as real people. One scene in particular that was both relate-able and touching between Wood and Pill had the two connecting over a conversation about the paths their lives took and the current state of their flailing careers. And that happens while there are little zombie children wandering the school looking for them! It's a great balance of writing between the horror of the zombies, the comedic absurdity of the situation, and the characterizations of the people. 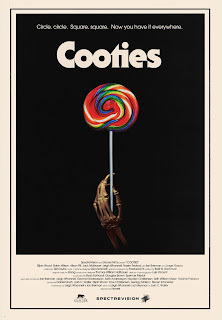 Cooties gets off to a fast start and sets up the story well and then it's a roller coaster ride through the child zombies and adult shenanigans as they figure out how to deal with what's happening. There are plenty of laughs and action along the way, lots of child zombie gore, and tons of fun. Seeing Rainn Wilson clothes-line 4th graders and spout one-liners like Bruce Willis in Die Hard while wearing silver aviators like Sylvester Stallone in Cobra truly is priceless. Go watch Cooties because it's a great freaking time!